Hi Shaun, my name is Janet. I watched your episode of Locked-Up Abroad and I felt compelled to write you. I have had personal experience with Maricopa's prison system as my ex-husband, David, has been working there for 10 years. He worked there while we were married, and I was integrated into the social aspect of the lives of Detention Officers. I have horrific tails of human rights violations that have haunted me for years. There are thousands upon thousands who have suffered under Sheriff Joe Arpaio’s reign. I lived in Phoenix for several years. David and I had a little apartment near Durango where he worked the morning shift. I was integrated into a world of severe meatheads and idiot guards. It was always amazing to me the kinds of people that were passed through the academy process. But the guards referred to each other as family, and so these people became my relatives. My husband was a particularly violent man. He was only 22, but already a monster. I feared him with all my being, but oddly still loved him and wanted only to please him and earn his approval. I guess that's the typical behavior of a battered wife. But the further he worked for Joe Arpaio, the further he continued to change. After having worked there for maybe 6 months or so, he came home one day with blood on his boots. Like most guards, he was very particular and protective over that "glassy mirror shine" created when a person spent the time and energy into perfecting their appearance, which they believed maximized their authority over the inmates. I was in shock! When he told me what happened, he focused on the fact that there was now blood on his boots, instead of focusing on the fact of how it got there in the first place. There was an inmate at this facility that the guards all called "Plums." It was unusual for any kind of playful nickname to be used on any inmate, and so I mistakenly took it to mean that they were friendly with him. My husband would come home all the time laughing about something Plums had said or done. I took it to mean that he though Plums was a funny fun guy... I didn’t realize till later that he was just mocking him. Apparently that day while David was doing his rounds, Plums thought it would be funny to pull a prank on him. Plums had failed to realize that there are no real friends between inmate and officer, and he was about to cross the line. Plums hid in his cell under his bunk. As my ex-husband entered the cell to take a quick look around, Plums sprang out and grabbed his leg. My husband had told me what happened next was just a natural reaction, but I don’t believe kicking an inmate in the face several times is any kind of natural reaction. David was a strong man. He was small, but strong. He kicked Plums several times in the face while he lay on the ground. When I asked David how he could ever do that to a friend, he laughed and told me "He's not a friend! He's an inmate!!... AND he got blood on my boots!" The rest of the night he focused on erasing the blood off his boot, while Plums lay in the hospital with a broken nose. 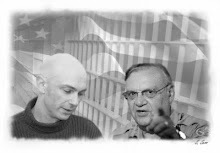 It was the start of my realization on how horrible the jails were, and how evil Joe Arpaio really is. As I watched your story last night I cried. I have repressed that life for a long time now and your story brought those years back. I haven't thought about my life with all the guards in a long long time! If you want to post this story it would be a real release for me. These incidents have haunting me for too long! 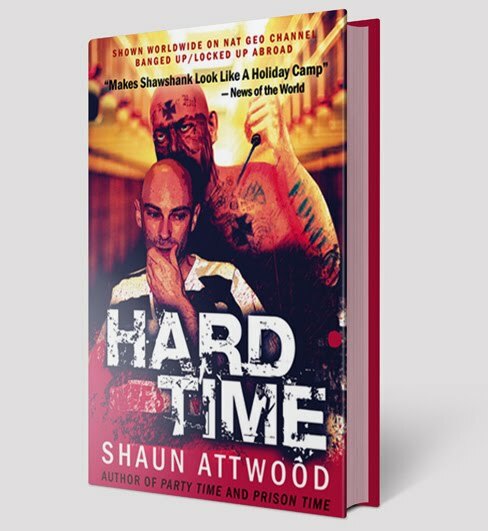 Click here for info about Hard Time, the book about how Shaun Attwood survived Arpaio's jail. Horrific. Stuff of which nightmares are made!